Bananas provide many nutrients that are essential for good health. 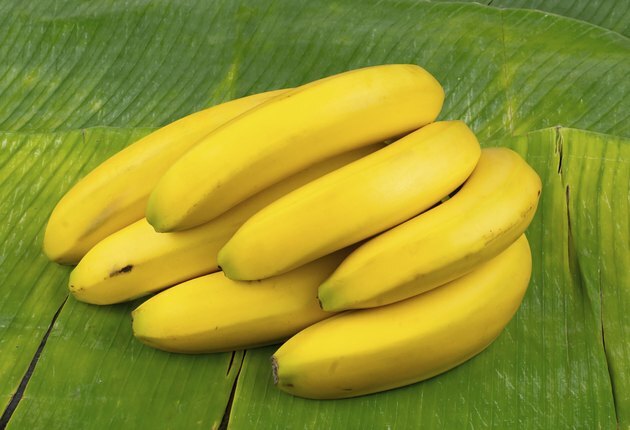 They are relatively low in calories -- providing about 121 per large banana -- and high in fiber, in addition to offering several vitamins and minerals. Banana fruit can be eaten plain or sliced and served in sandwiches, fruit cups, custards and salads. You can also add banana slices to your breakfast cereal. One large banana contains 487 milligrams of potassium. This amount equates to 10.4 percent of the recommended daily value for potassium. Potassium plays a fundamental role in nerve function, blood pressure and muscle control. It helps regulate water and mineral balance throughout your body. According to the Colorado State University Extension, a high potassium intake has also been associated with decreased risk of death due to cardiovascular disease. Potassium and sodium work together to maintain normal blood pressure. A strong link exists between a high-potassium diet and bone health, especially among elderly women. This indicates that consuming potassium-rich foods may help prevent osteoporosis, notes the University of Maryland Medical Center. According to the U.S. Department of Agriculture, one large banana offers nearly 4 grams of dietary fiber, which helps maintain good digestive health and support regular bowel movements. Eating fiber has been shown to contribute to the treatment of conditions such as heart disease, diabetes, hemorrhoids, high cholesterol, constipation and gastrointestinal disease, reports the University of Maryland Medical Center. Aim for 25 to 30 grams of fiber per day. Bananas are a rich source of vitamin C. One banana provides about 12 milligrams, or 13 percent to 16 percent of your daily recommended amount for vitamin C. This nutrient plays a critical role in the growth and repair of tissues of your body. It helps your body manufacture collagen, an important protein used to make tendons, ligaments, blood vessels, cartilage and skin. The water-soluble vitamin also helps repair and maintain bones and teeth. Without vitamin C, you body cannot heal wounds. As an antioxidant, vitamin C helps battle free radicals, rogue molecules that damage your DNA. Population-based studies propose that people who consume foods high in antioxidants, including vitamin C, carry a lower risk for developing high blood pressure than people who eat a poor diet, reports the University of Maryland Medical Center. Some studies also show that vitamin C can halt the progression of atherosclerosis -- hardening of the arteries. Eating one large banana provides you with 0.5 milligrams of vitamin B-6, meeting more than 38 percent of the recommended dietary allowance for the vitamin. Vitamin B-6 assists your body in the production of antibodies, proteins that help fight many diseases. It is essential for normal nerve function. Your body uses this water-soluble vitamin to make hemoglobin, which carries oxygen to your body's tissues. The vitamin also helps keep blood sugar levels healthy. What Is the Nutritional Value of a Clementine? Are Bananas Bad for Men?